Here's a fun nature activity you can do at night! Watching the stars is pretty cool and is a relaxing way to end the day. You can do this activity anywhere - at home, at a friend's, on a camping trip, or wherever else you are! To avoid cloudy nights where you can't see the stars very well, watch the weather forecast ahead of time to see if it will be cloudy on the night you want to go out stargazing. Head outside on a warm summer night, late enough so that the sky is dark and you can see the stars. If it's cloudy out and hard to see the stars, you'll have to wait for another night! 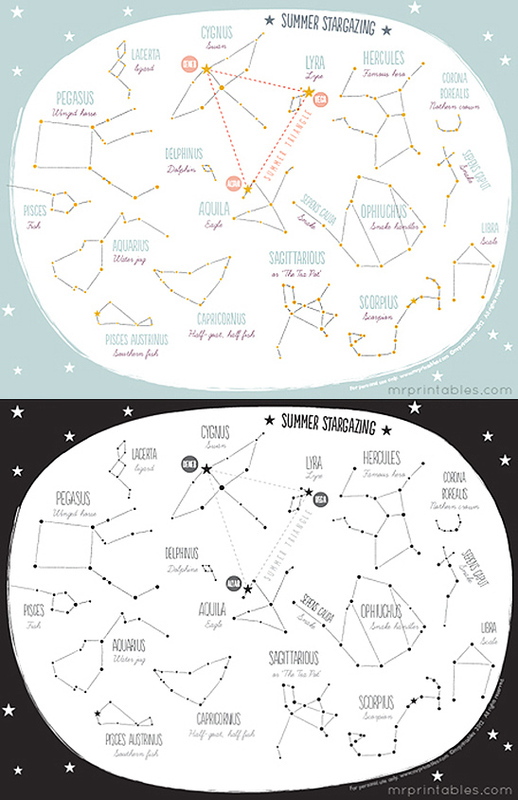 Before you go out, take a look at a Summer Constellation Map. Print one off and take it out with you to try to identify constellations. This website also provides a great guide to Summer Stargazing with information about the different constellations! Lay down on the ground and watch the stars. Look for constellations, shooting stars, planets, airplanes, and other cool things you might notice while you are stargazing. Using a flashlight, look at your constellation map to help you identify different patterns of stars you can see in the sky. What are stars made of? Is the sun a star? What is a constellation? Do the constellations stay in the same spot in the sky for the whole year? How many constellations did you spot? What are the names of those constellations?